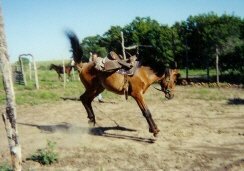 Bucking horses is a common behavior problem that needs to be handled correctly from the start. By understanding what it is that causes a horse to buck, we can help eliminate this behavior. When we are not in the picture, a horse may buck and run around just because he feels good. When a horse gets to bucking in situations around people, it is always out of a need of self-preservation! Always! We would never want to think that a bucking horse is being mean or trying to get at us. With a horse, it is never personal. This need for self-preservation can be brought out by fear or confusion on the bucking horses part. Often we find a bucking horse when something is presented to him or asked of him that he can’t understand. What we call overexposure. The resulting fear or confusion leads to this unwanted action. The horse doesn’t want to buck either. When he does, his mental state is in disarray, and he is operating on a survival instinct. I believe that the term natural horsemanship is misleading on account that nothing we do to or around a horse is truly natural for them. The “natural horse” would be out on some range, free or soaking up shade under a tree, and we wouldn’t be in the picture. Since this is the case, and we are the “intruders” into his world, it is our responsibility to communicate clearly and with feel. The horse always has a God given right to protect himself. It is our job to approach him in such a way as to keep this need/right to self-preservation as quiet and calm as possible. There are many situations when a horse will buck: Maybe the first time he’s saddled, asked for a lope/canter or maybe when he is startled. There are different approaches to handle each situation. All these variables cause a lot of people problems. But, if we could take a different approach and see all these variables (on why a horse does what he does) as a challenge or part of the learning process, it would help us to better communicate. One of the most common things I hear is “I don’t know why, but my horse just started bucking.” This puts the bucking horse in a bad light, and we don’t want to do that. Unless startled, I can’t ever think of a time when a horse just started bucking. There is always a cause and warning. We just have to be looking and thinking. Am I using different gear (tack) that might be causing him pain or discomfort? Am I acting or presenting things in such a way that it brings fear or confusion to the horse? Am I going to fast in my training and (skipping those important foundation blocks) overexposing my horse? There are so many variables to why a horse will buck – it is our job to pay attention and communicate clearly and with feel. There are, however, situations that can come up where even when working with feel and clear communication, things happen. For example, you may be putting the first ride on a colt and a dog or a plastic bag, or something startles your horse. It’s times like these, you would want to be sure you had a good, basic foundation set in – a foundation that helps the bucking horse to feel of you, or look to you when he’s scared. If you’ve already taught the horse that you’ll be there, you can head off most of these situations pretty quick. When I’m riding a colt or a horse that has a tendency to be spooky (maybe one that has been abused ) these are some things I really want to have established in the horse. By having taught the horse to flex/bend, you would be able to get his head back to you, which can help him feel and turn to you when he gets troubled. After getting his head mentally and physically, next you will be getting his hindquarters. (Some would refer to this as a one-rein stop) When he does this, you are able to comfort him and reassure the horse that you’re still there and it’s going to be ok. These above mentioned exercises need to be established good on the ground before you would ever expect to get them on the horses back. It is my belief and experience that whether your horse is getting ready to buck or already taking a streak – when you have these two foundation basics solid in your horse, you can head off the situation. When the horse is bucking, and you flex his head to the side, and his hindquarters follow, you’ve effectively taken his mind off the situation and disengaged his motor. This would need to be working from the ground first before I did it on his back. Remember what happens on the ground is what happens on his back. Every horse I work with, whether he is “broke” or a fresh colt, I build these things in really strong from the ground first. The reason is to have a foundation already there that I can build on when I begin to ride him. Tom Dorrance said he liked to keep the buck in them (not on the outside) and I’ll have to agree with him about that. For more information about Bucking Horses, please contact us.